The campsite opens a day before the Motorhome and Caravan Show begins. 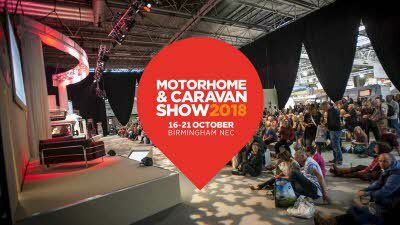 Come and stay a stone's throw away from the Motorhome and Caravan Show at Birmingham's NEC, 16 to 21 October 2018. The Caravan and Motorhome Club will run a temporary campsite here with 400 pitches available per night over the duration of the show (that's 2,940 pitch nights available in total). We will also throw in some toe-tapping evening entertainment as part of your pitch price. Due to limited availability please call the booking office on 01342 336666 to make your booking. We're offering a 'Super Sunday' discount on both paved and shingle pitches. That means pitches start from just £21, making your visit to Birmingham even more affordable! Not only that - if you are driving in via the M6, members can save up to £9 with the M6toll booth offer. In poor weather conditions the shingle pitches can become wet and sometimes muddy. Please bring appropriate footwear. We are pleased to announce that SsangYong will be supporting the Club this year at the forthcoming Motorhome & Caravan Show by sponsoring the entertainment marquee on the Club’s Temporary Campsite. The ‘SsangYong Marquee’ will again provide the venue for the evening entertainment and also house the bar and food outlet. This line up may be subject to change. Open to Caravan and Motorhome Club members and non members. Pitches available from Monday 15 October 2018 to Sunday 21 October 2018 (inclusive). Full Payment will be taken at the time of your booking. A cancellation fee of £20.00 will be charged for all cancellations up to Tuesday 9 October after this date no cancellations will be refunded. There will be 210 paved pitches per night including blue badge pitches @ £36.00 per night and & 190 shingle pitches per night @ £31.00 per night. In poor weather conditions the shingle pitches can lay wet & a bit muddy. Please bring appropriate footwear. All outfits welcome but no awnings or tents. Pitches available on arrival day from 11.00am up to 10.00pm. Arrivals after 10.00pm will be put on a temporary pitch by Security with no electric and re-sited from 8.00am the following morning subject to pitch availability. Pitches to be vacated on departure day by 10.00am. All pitches include Electric Hook Up (EHU) at a maximum of 6 amps only. Fresh water will be available. Highly recommend Motorhomes fill up before arriving onto the site. Black, grey and dry waste disposal will be available. Own sanitation is essential; there is a toilet block but no showers. Mobile Bar and Catering facilities available on site in marquee. Free evening entertainment (Monday to Saturday night inclusive). Dogs are allowed provided they are kept on a lead at all times and should not be left unattended for long periods. 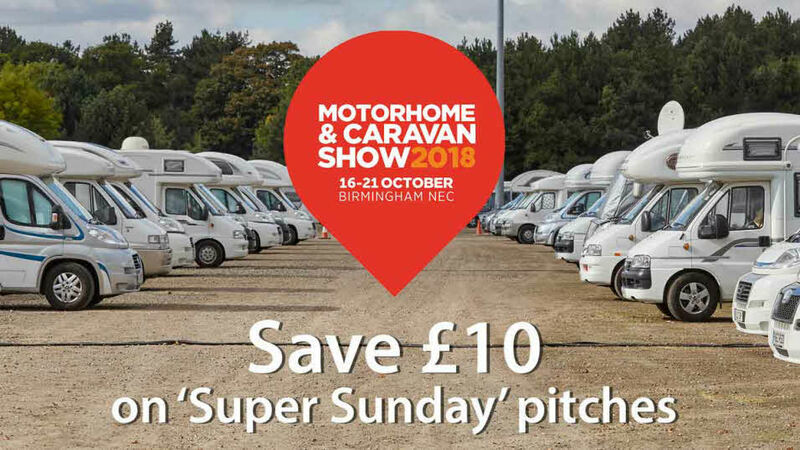 Browse hundreds of stands at the Motorhome & Caravan Show and enjoy exclusive offers on caravans, motorhomes and accessories.